The kingdom of Druk Yul or Bhutan as the worlds know it, is both a modern and ancient land. While recorded history dates as far as back as the Sixteenth Century A.D., the modern history hardly spans three decades. Bhutan enjoys the distinction of being one of the only two countries in Asia that has been never colonised by any western power. The state of the land and its natural attributes, and the way of the people and their cultural riches are, therefore, all intact at a time the world is preparing to awaken to a new Twenty First century. Set in the heart of the mighty Himalayas, the country of not more than 650,000 people constitutes one of the most rugged surface of the earth. This gift of geography combined with the determination of the inhabitants allowed the Bhutanese race to be itself regardless of the world and its changing ways beyond its mountains and gorges. Bhutan`s geography is truly amazing. In this small chunk of land that lies wedged between India and China altitudes vary from 200 meters in the south to nearly 8,000meters in the north at the Tibet border. The warmth of Italy and the cold of Siberia can all be experienced in a single day`s journey from the south to the north. The foothills and valleys in the south enjoy subtropical climate with hot and humid summers and warm winters. In the north, summer are short and cool, and winters are cold with considerable snowfall and heavy frost. The rainy season of the Monsoon generally sets in from June and lasts till the end of September. Vegetation, similarly, ranges from moist h jungles rich in tropical species in the south to temperate and subalpine varieties in the north. Bhutan`s forest resources are considered unique by scientists who regard the eastern Himalayas to be one of the ten global environmental hot spots of the world. Bhutan`s diverse flora and fauna include an estimated 700 bird species and at least 5000 species of vascular plants. The Bhutanese people belong to the Mongoloid race. While the national language is `Dzongkha`, different regions speak separate dialects, such as Nepali among the settlers of Nepali origin in the south. However, in the government, alongside `Dzongkha` English is commonly used, and therefore, its usage is quite wide. Bhutanese dress are intricately hand-woven with many bright colors. 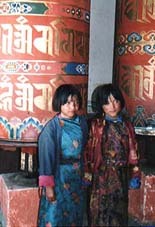 The male dress is the robe-like `gho` worn at knee length, and the woman wear the `kira` at ankle length. As Buddhism is the state religion, almost all Bhutanese follow the Buddhist faith. 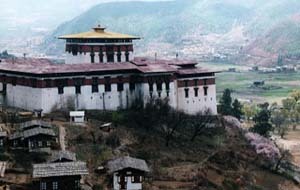 The state maintains a large clergy whose residence is provided in the many `dzongs` or castle fortress which served as centres of religious and cultural activities, and the seat of civil authority. The `dzongs` and their functions have remained virtually intact to this day. Hence, the chief annual festivals or `tcechus` of every community and district are conducted in their respective dzongs. 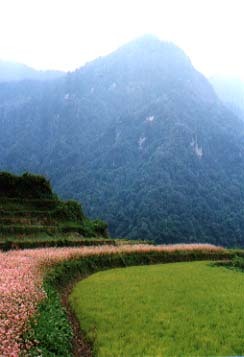 Nearly 90 percent of all Bhutanese are farmers, growing rice-the staple grain-wheat, maize, and rising livestock. Their houses built of rammed mud, stone and wood are brightly painted and generally have three floors. And like the Swiss chalet, they are shingle roofed. Their craftsmanship extends to bamboo weaving, silver work, bronze casting, carving and painting. As mountain people everywhere Bhutanese are sturdy and good natured, and always love a game of archery, the national past time. The monetary unit is the Ngultrum, and the rate of exchange with the U.S. Dollar is 42 Ngultrums to one Dollar (Oct, 1999). Before the advent of modernization, Bhutan was a largely self contained rural economy. The Bhutanese people developed farming systems which met their substance needs and used available resources in sustainable manner. With the exceptions of salt everything was produced or available in the country. All these changed with coming of Bhutan`s third monarch when he succeeded his father to the throne in 1952. King Jigme Dorji Wangchuk had a vision of another Bhutan. He wished a life with better health and therefore, chose to open the doors to his hermit kingdom and lead his people on the path to modernization. The first modernization plan was launched in 1960, and since then there has been no looking back.